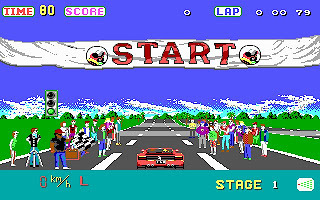 OutRun was first released in 1986 by Sega as an arcade game. 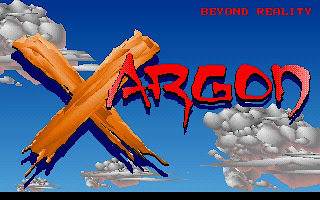 It was a major hit with arcade-goers and is notable for its innovative hardware, pioneering graphics and music, a choice in both soundtrack and route, and its strong theme of luxury and relaxation. 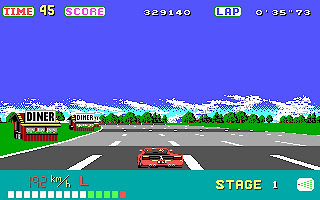 OutRun was ported to PC in 1989, supporting 16-color EGA graphics and PC Speaker. 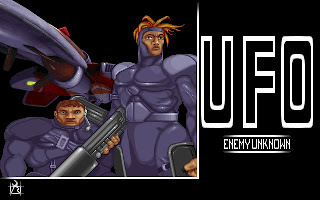 Like Lotus III, it uses 2D sprites to create a 3D feel, not using the real 3D engine. 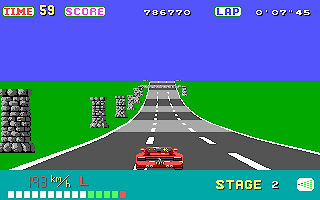 In OutRun, we control a car with our girlfriend in the passenger seat. The car looks like a Ferrari, but there is no any indication that it is a Ferrari. 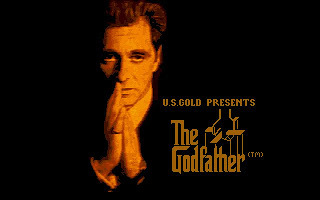 It should be because Sega never secure a license from Ferrari. 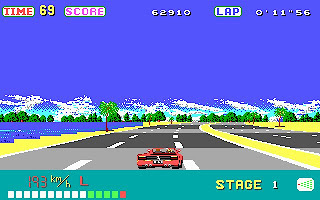 The gameplay for OutRun is pretty simple, we need to drive our car as fast as possible to the next check points before the time running out. 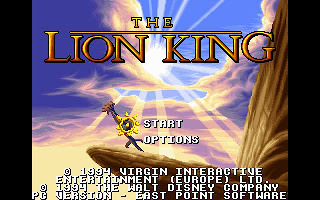 There are a few backdrops in OutRun, like beach side, jungle and city. Of course, don't expect seeing all the trees and buildings as they are shown as a plain signboard only. 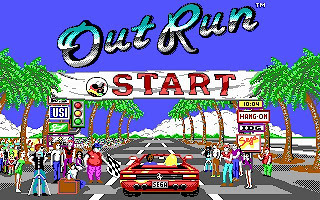 You can download OutRun here.